A Haryana BJP leader angered many after questioning why Varnika Kundu, who was stalked in Chandigarh, was "allowed to stay out late." Now, women are defiantly tweeting pictures of themselves out at midnight with the hashtag #AintNoCinderella. New Delhi: "Why was she allowed to roam around at night?" Haryana BJP vice president Ramveer Bhatti's callous remarks in response to the stalking of a woman in Chandigarh, allegedly by Haryana BJP chief Subhash Barala's son, angered many. Overnight, a deluge of selfies with the hashtag #AintNoCinderella flooded Twitter. 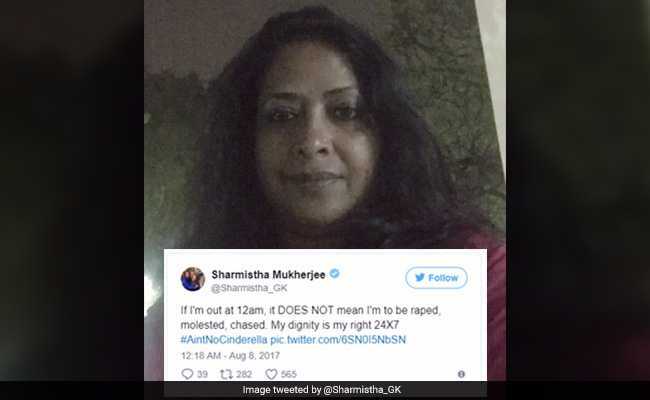 Congress leader Sharmishta Mukherjee and actor-turned-politician Divya Spandana, also known by her stage name, Ramya, tweeted selfies of themselves out past midnight. "If I'm out at 12am, it DOES NOT mean I'm to be raped, molested, chased. My dignity is my right 24X7 #AintNoCinderella," tweeted Ms Mukherjee. Ms Spandana, meanwhile, simply tweeted a selfie with the hashtag #AintNoCinderella. And while Mr Bhatti has since backtracked on his remarks, women on Twitter have been posting pictures of themselves out late at night, with the hashtag #AintNoCinderella. Who came up with - #AintNoCinderella? Badass! It's so sad that I can't tweet on this like all the women here. A big #ShoutOut to you all. On Friday, 29-year-old Varnika Kundu was chased on the streets of Chandigarh and nearly kidnapped, allegedly by 23-year-old Vikas Barala and his friend. She wrote about the terrifying experience in a Facebook post that went viral. Haryana BJP vice president Mr Bhatti was skewered on social media for questioning why Ms Kundu was "allowed to stay out late." Responding to his remarks in an interview to NDTV, Ms Kundu, said: "It is none of his business, it is my business and my family's what I do and where... If it wasn't for men like these, I wouldn't be unsafe going out... whether it was 12 am or 2 am or 4 am."